Carolyn Jabs has written about families, ethics, environmental issues and the Internet for almost four decades. 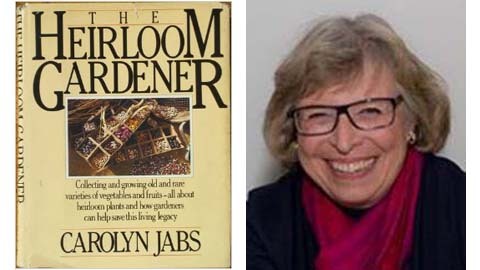 In 1984 she published The Heirloom Gardener (Sierra Club Books), a book “often cited as a turning point in the pro-heirloom movement.” Hundreds of her articles have been published in magazines ranging from Readers Digest and Redbook to Self and Working Mother. Her opinion essays have appeared in Newsweek and the New York Times. In the 90’s, Carolyn started writing about how computers infiltrated American homes, first as a Contributing Editor at Home PC and then at Family PC. When the dot.com crash shuttered those publications she started a monthly column, Growing Up Online, which she self-syndicates to regional parenting publications. Now, over ten years later, she continues to give parents practical advice about raising kids who are as safe, savvy and responsible online as they are in the real world. When the oldest of her three children went off to college in 2001 Carolyn decided to go back to school too. She studied Practical Philosophy (aka Ethics) at Bowling Green State University where she earned her MA in 2005. In that program Carolyn met Dr. Donald Scherer, an environmental ethicist with a unique way of thinking about conflict. For the past six years they have collaborated on a book entitled Cooperative Wisdom which they plan to independently published in 2015. Written as a dialogue between a teacher and a learner, the book proposes five contemporary virtues that promise to dissolve conflict and restore cooperation in environments ranging from families to corporate board rooms. Carolyn and her husband, David, moved to Santa Barbara in 2013. She was an active AWC member when she lived in Toledo, Ohio, and won several Crystal Awards in their annual competition. Now she feels very fortunate to reside in the only California city with an AWC chapter. At every AWC-SB meeting she learns things she didn’t know before, meets accomplished, energetic women and leaves feeling inspired to become a better communicator. Her husband thinks they’ve moved to Santa Barbara to retire, Carolyn expects to write (and be an AWC member) for the rest of her life! This entry was posted in Featured, Featured Members on October 8, 2014 by Lisa.